The Latino's Guide To Parenting present 50 clear points on what you need to do to be an effective father in today's demanding world. Full of practical, easy-to-read advice and illustrated with color pictures of children and fathers, this book will help every Latino father find realistic ways to deal with the challenges of being Latino in the world today for your children and yourself. 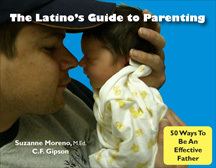 The Latino’s Guide to Parenting is the winner of the Honorable Mention Award for Best Self Help Book at the 2009 Latino Book Awards.